Stratford-upon-Avon is located in Warwickshire in the Midlands. London is about 105 miles, Birmingham is about 30 miles and Bristol about 70 miles away. Stratford-upon-Avon - Travel by coach - If you'd like to speak to someone about your journey you can ring Traveline on 0871 200 22 33. Local buses - West Midlands Travel. Tel: 01203 220014. 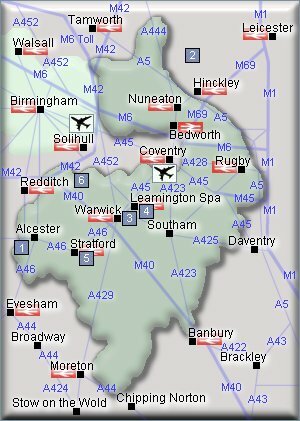 Stratford-upon-Avon - Travel by road - Stratford-upon-Avon is about 7 miles SW of Junction 15 of the M 40 Motorway. The M 40 Motorway links London to the West Midlands. Stratford-upon-Avon is about 25 miles from Solihull, Birmingham and 105 miles from London. Stratford-upon-Avon - Travel by train - Stratford-upon-Avon Station, Station Road, Stratford-upon-Avon, CV37 6PL. CCTV. Ticket office. Waiting room. Refreshment facilities. Pay phone. Toilets. Only parts station step free access. Direct service from London takes about 2 hours. Stratford-upon-Avon - Sport - Stratford Leisure & Visitor Centre Stratford Upon Avon. Tel: 01789 268826. Stratford Community Sports Centre, Alcester Road, Stratford. Tel: 01789 267661. Stratford on Avon Town Football Club, Alcester Road, Stratford-upon-Avon. Tel: 01789 297479. Stratford-upon-Avon - Sport - Stratford-on-Avon Golf Club, Tiddington Road, Stratford-upon-Avon, Warwickshire, CV37 7BA. Tel: 01789297296. Stratford-upon-Avon - Shopping - Stratford-upon-Avon has a good selection of shops, restaurants and tearooms. There is a regular Farmers Market held in the Market Sqaure on the first and third Saturdays of each month. Marks & Spencer, 29 Bridge Street, Stratford upon Avon, Warwickshire, CV37 6AS. Tel: 01789 292430. British Home Stores Stratford-upon-Avon - Bridge Street, Stratford Upon Avon, CV37 6AD. Tel: 0845 8410277. Woolworths - 6-7 Bridge Street, Stratford upon Avon, CV37 6AL. Tel; 01789 293383. Lloyds Pharmacy Stratford Upon Avon. Tel: 01789 292835. Boots The Chemists Stratford Upon Avon. Tel: 01789 297223. Alliance & Leicester Stratford Upon Avon. Tel: 01789 298772. Birmingham Road Post Office Stratford Upon Avon. Tel: 01789 297575. Stratford-upon-Avon - Entertainment - Stratford-upon-Avon is a picturesque town beautifully situated on the river and with a wealth of black and white timber framed buildings. A children's trail links the Butterfly Farm and Teddy Bear Museum with other attractions including the famous Ragdoll Shop, home of Tots TV, Rosie and Jim, Brum and the Teletubbies. There are a number of theatres in Stratford itself, notably the Swan, a replica Elizabethan stage, and the Royal Shakespeare Theatre. Royal Shakespeare Company, Royal Shakespeare Theatre, Waterside, Stratford-upon-Avon, Warwickshire, CV37 6BB. Ticket Hotline - 0844 800 1110. www.rsc.org.uk. Stratford Cinema, Windsor Street, Stratford-upon-Avon. Tel: 01789 415500. Stratford-upon-Avon - Other information - Stratford-upon-Avon is the birthplace of William Shakespeare and visitors can enjoy the Birthplace Museum. Shakespearience, Waterside Theatre, 8-13 Waterside, Stratford-upon-Avon, Warwickshire, CV37 6BA. Tel: 01789 290 111. Location: In the centre of Stratford Upon Avon. Stratford-on-Avon District Council. Tel: 01789 267575. The Teddy Bear Museum, 19, Greenhill Street, Stratford-upon-Avon. Tel: 01789 293160. Stratford Library is just below Shakespeare's Birthplace in Henley Street. Tel: 01789 292209. Stratford-on-Avon District Council, Elizabeth House, Church Street, CV37 6HX. Tel 01789 267575. For hotels accommodation in other areas nearby see Chipping Norton hotels & Leamington Spa hotels. 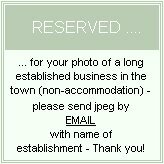 For bed and breakfast accommodation in other areas near to Stratford Upon Avon see bed and breakfast in Leamington Spa & bed and breakfast in Warwick. Stratford-upon-Avon is about 7 miles SW of Junction 15 of the M 40 Motorway. Rail Stations (Not all stations shown). There is a station in Stratford-upon-Avon.